A frontline socio-political pressure group christened Enugu Youth Coalition has congratulated the good and peace-loving people of Enugu State for making it yet to another great year in the land of the living. In a new year message, the national coordinator of the coalition, Dr. Edwin Obune said the state has witnessed an unprecedented God's blessings and favours in the past three and half years because it has a God-fearing leader who understands the true meaning and essence of peace in all he does. The group further called on the people and residents of the state to continue to show their total and unalloyed supports to the government of Rt. Hon. 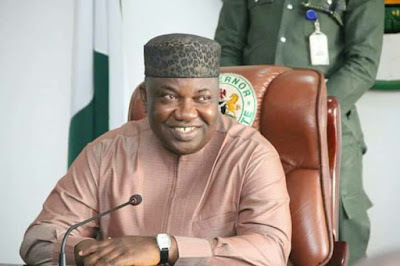 Ifeanyi Ugwuanyi as he strives to make the state great again, saying they should never allow people who have nothing good to offer them besides lies and empty promises to deceive them as the state is too sophisticated to be in the hands of conmen. The statement further urged the electorates to vote and defend their votes for a leader who constructed 450 Kilometers of roads for them inspite of the state's megre resources. Who empowered 2,400 traders with N50, 000 each for them to start and sustain their businesses and livelihoods. Who constructed and renovated more than 589 Primary and Secondary Schools block and procured modern learning tools and equipments for our children. Who employed over 4,000 teachers and empowered another 750 youths in the state in line with the United Nations Sustainable Development Goals. Who constructed over 100 units of one bedroom apartment for 100 lucky civil servants in the state between Grade Level 1 and Grade Level 10.
Who rehabilitated the facilities at Ajali and Oji-River Water Treatment Plants which is providing clean and portable water to our people in the state. Who constructed and renovated district hospitals and health centres across the cities and rural areas of the state. Who constructed new court buildings and opened registeries in the Judicial Divisions and Magisterial Districts of the state. Who completed the Enugu State Diagnostic Centre started by previous administrations in the state without indepting the state or the next generations to huge dept profile. No doubt, the state have had it so good in the capable and able hands of Governor Ifeanyi Ugwuanyi. That is why some notable and influential national newspapers which are The Sun Newspaper, Vanguard Newspaper, Daily Independent Newspaper and The Leadership Newspaper nominated him as their Governor of the year 2018 and will present the prestigious awards to him this year to glory of God and the good people of the state. Therefore, it is incumbent upon us to collectively re-elect Gburugburu as what he has done in his first term is just a tip of the iceberg when compared to the great and mighty dreams and visions he has for the state and it's people. Finally, Enugu State is in the Hands of God and by the grace of God, the coming governorship election in the state will end in praise to the glory of the awesome God we serve. Happy New Year to Ndi-Enugu!